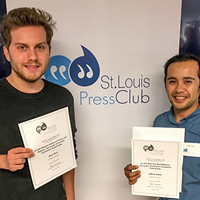 Four Webster University School of Communications students were among the 15 winners of St. Louis Press Club Scholarships at a special awards luncheon at the Press Club on June 12. Three undergraduate students and one graduate student were each awarded a $1,000 scholarship applicable to the 2018-19 academic year. 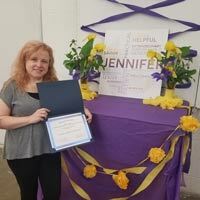 Jennifer Hylton-Whited, representative for the Department of Art, Design and Art History (DADAH), was selected as the 2017-18 Student Employment Supervisor of the Year. She was nominated by nine of her student workers. A surprise party was organized in her honor by students and colleagues. See other outstanding nominees and previously announced Student Employees of the Year. More than 300 guests joined Chair of the Board of Trustees Lynn Britton, President Beth Stroble, and Provost Julian Schuster for the 2018 Scholarship Dinner. 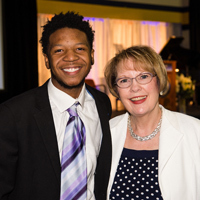 This special evening unites Webster University scholarship recipients with their patrons to celebrate, connect and learn from each other. The evening also featured live music by Webster students and a tribute to Dr. Donald Suggs. 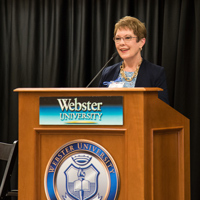 Webster University is grateful to all who attended and appreciative of our donors' support of Webster students. Webster University President Beth Stroble and Provost Julian Schuster were interviewed by Galaxy Radio to discuss recent federal funding news for higher education with Pell Grants, SOE Grants and work study, plus on-going proposals to revise the PROSPER Act, and how they directly affect Webster students. 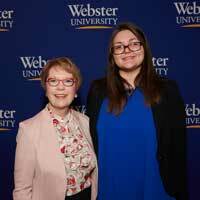 Webster University has tripled the number of students receiving Presidential Scholarships in the past two years. Fifteen students will receive the full-tuition award that is the largest academic scholarship offered to any student at the institution when they start school in the fall. This is the largest number of Presidential Scholars in the history of the award. More than 120 applicants were narrowed to 32 finalists who appeared on campus for interviews. The Office of Admission and President Beth Stroble will host the 2018-2019 Presidential Scholarship Competition on campus on Saturday, Feb. 10. 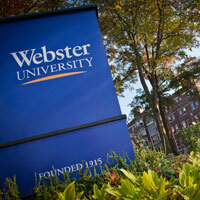 The Presidential Scholarship is the largest academic scholarship offered to any student at Webster University. On Saturday 32 finalists will compete for five full-tuition scholarships after interviewing with Webster faculty, staff and current student leaders. 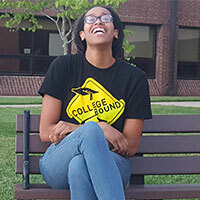 Webster University recognized an opportunity three years ago to provide financial support to AmeriCorps alumni and enrolled in the Segal AmeriCorps Education Award Matching Program. This program allows AmeriCorps graduates the opportunity to pursue a variety of masters’ degrees through a tuition matching program. 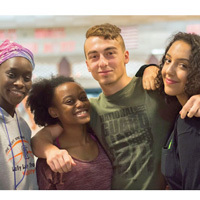 The Transitions and Academic Prep (TAP) program is an intensive, 10-day residential program for Transitions students. This year, the TAP program ran July 19-28. This year’s TAP cohort experienced an even more focused academic curriculum than previous cohorts with 28 students engaging in a 2-credit-hour WRIT 1000: Basic Writing Workshop course that focused on writing, academic integrity and research. The program also encouraged students to delve deeper into topics of diversity, privilege and oppression. The Academic Resource Center and academic partners throughout campus are gearing up for the Summer TAP (Transitions and Academic Prep) program to be held July 19-28, 2017. TAP is a free residential program for conditionally admitted Transitions students who are new to Webster. During the 10-day program, TAP students live on campus, take a two-credit college course, and participate in campus workshops and activities, including the faculty "lunch and learn," to help them transition to university life. 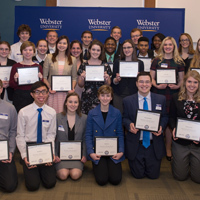 Webster University has doubled the number of students receiving Presidential Scholarships, a full-tuition award that is the largest academic scholarship offered to any student at the institution. Ten students were named Presidential Scholars this week, the largest group in the history of the award. Webster University was one of five institutions of higher education in the region lauded for offering greater educational success to students from “underrepresented populations.” The citation was made Friday during the “Stand with Students” symposium sponsored by the non-profit St. Louis Graduates and the St. Louis Regional Chamber of Commerce. Webster Leadership Advocate for Student Aid, Develop Partnership in D.C.
Webster University President Beth Stroble, Provost, Senior Vice President and Chief Operating Officer Julian Schuster, and Associate Vice President for Government Relations and Sponsored Programs Carolyn Corley traveled to Washington, D.C. last week to advocate for student financial aid and advance Webster relationships with U.S. and international partners. Announcement from the U.S. Department of Education regarding data retrieval tool protection: To protect sensitive taxpayer data, the IRS and FSA announced today the Data Retrieval Tool on fafsa.gov and StudentLoans.gov will be unavailable until extra security protections can be added. While they are working to resolve these issues as quickly as possible, students and families should plan for the tool to be offline until the start of the next FAFSA season.